George Harrison: Living in the Material World is now available in a Multi-Touch edition that brings the book alive with audio from Harrison himself, as well as from Eric Clapton, Paul McCartney, Ringo Starr and others. Available exclusively on the iBookstore, this elegant, fully immersive book also includes image galleries and videos from both the Scorsese film and the Harrison archive, giving readers an unparalleled reading experience on iPad. 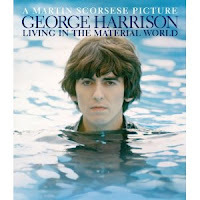 The critically-acclaimed Martin Scorsese documentary, George Harrison: Living in the Material World, which premiered on HBO last October, is available on home video May 1. Get the film here or here. Finally.